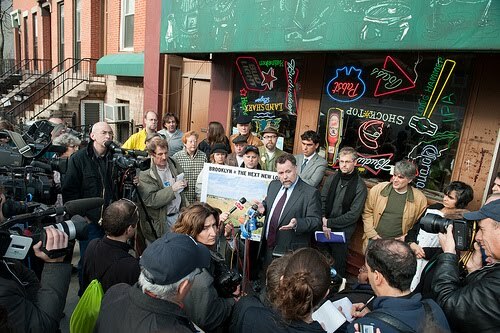 At Develop Don't Destroy Brooklyn press conference yesterday outside Freddy's Bar & Backroom, slated for condemnation, DDDB spokesman Daniel Goldstein was careful to describe Atlantic Yards as a "proposed project" and to say that "the fight against the abusive, corrupt Atlantic Yards development proposal is far from over." "It's also a matter for the executive branch," said Goldstein, challenging Gov. David Paterson. "So, besides the four outstanding lawsuits and besides what the plaintiffs in this case intend to do," he said, 'we are calling on Governor Paterson to put a stop to the taking of properties... And it's up to Governor Paterson if he wants this part of Brooklyn to be the next New London." Goldstein cited the aftermath of the Kelo case and asserted, "This is what we will get at this site in Brooklyn if the eminent domain takings are allowed to go forward and if the project is allowed to go forward. The best case scenario would be a money-losing arena and 20 acres of parking lots." That 20 acres is a significant exaggeration. He noted that, as a Senator, Paterson called for a moratorium on the use of eminent domain. 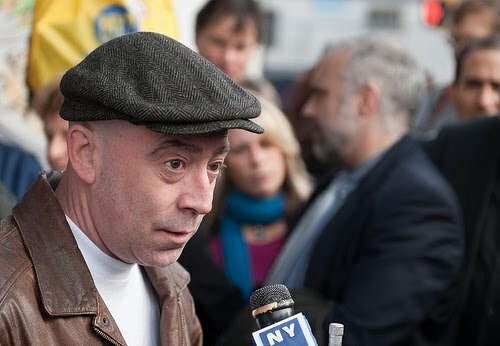 He read a statement from Assemblyman Hakeem Jeffries, who has not stood with DDDB but has said he opposes eminent domain for a basketball arena but yesterday said that the use of eminent domain in this case was an abuse of an extraordinary power. Goldstein asserted that the ruling was the first in a long series of steps leading to the takings of people's homes and businesses--likely a stretch, unless DDDB's new lawsuit--and the legal strategy behind it--proves effective. DDDB attorney Matthew Brinckerhoff also called the ruling the first step in a multi-step process--a statement that obscured the significant victory yesterday for the state. The next step is for the Empire State Development Corporation (ESDC) to formally try to seize properties. He also said a lawsuit would be filed to require the ESDC to reach new findings regarding the public benefits of the condemnation, noting that that Court of Appeals said it was constrained by the record compiled "in 2004 and 2005" (though it was completed in 2006). He cited the new Modified General Project Plan, noting that the New York City Independent Budget Office has issued a report saying the project--actually, the arena--is a net money-loser for the city. He said that the Vanderbilt Yard, "which is supposed to be upgraded, is now going to be diminished and downgraded"--though the Metropolitan Transportation Authority surely can say that the railyard, though smaller than once expected, would be improved. 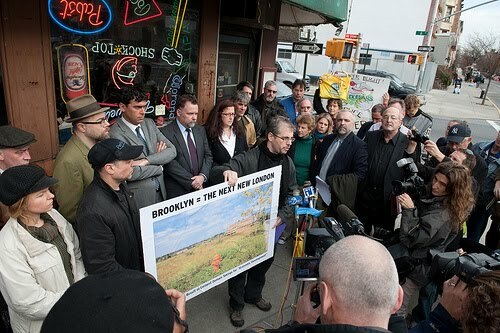 He also noted that the amount of money the MTA would received is diminished over time. The MTA might say that it's still promised $100 million, but it has essentially loaned money to Forest City Ratner at a 6.5% interest rate. "We will file a motion to compel the ESDC to issue new [Eminent Domain Procedure Law] Determination and Findings, and once they do that, we will start this process over again," he said. "We lost Round 1, but this is a multi-round fight." Are there any other eminent domain cases in which such a legal tactic has been successful, asked Eliot Brown of the New York Observer. No, said Brinckerhoff, who indicated that many of the legal cases in the Atlantic Yards fight have broken new legal ground. He noted that it's one thing to issue a Modified General Project Plan "which doesn't trigger a whole new set of rights.... but if they issued new EDPL findings, they'd restart the clock" and allow people to again challenge the determinations. Why would the ESDC's determination of public benefits for the project change? Can condemnations be stopped without an injunction? Brinckerhoff said there were two strategies: "One is an affirmative case to get [the court] to order the ESDC to make them issue an amended finding. The other is using the same issue... as a defense to the action that they will presumably now bring that they will use to take the property." In other words, he thinks that, in what is generally a process where there's little opportunity for challenge beyond narrow procedural issues, there's an opportunity to raise a major policy argument. That also would be an effort o break new legal ground. He also expressed dismay at the court's willingness to acknowledge the evolving notion of blight but treat literally a provision--untested in court--that the plaintiffs argued confined state subsidies to low-income housing. "They said, for purposes of eminent domain, slums now mean anything that looks bad, but for purposes of Section 6, slums only mean what slums were in the 1930s," he said, suggesting that the same language was being interpreted in different ways. "There's definitely precedent to force an agency to comply with its legal obligations, and its obligation is to make a finding based on reality, not a fantasy," he said. "They cannot tomorrow serve anybody with an eviction notice," he said, noting that condemnation is a two-step process, and "we're going to try to go back and re-start step one." Goldstein asked what would happen if the sheriff tried to evict him. He paused. Beverly Corbin of United Neighbors of Brooklyn and FUREE (Families United for Racial and Economic Equality) said people would gather in front of his building. Residential tenant David Sheets (left) and property owner Henry Weinstein also spoke. Sheets lives three doors from Freddy's and once worked as a bartender there. He spoke so softly that I couldn't hear him, but the video captures his words. "I'm not an attorney, but I am a paralegal. I know my way around a legal document... This is a scam. It's sucking up to the public trough. These are welfare kings, and it needs to be looked at that way." There are processes on the books to guarantee public participation, he said, but "the state and developer have done everything they could think of to reduce those to nothing more than occasional acts of civic masturbation. They are utterly meaningless." "We should not have to live like this--no one should," he said, a reference to not just the broader battle but the experience of living on a street where utility work and demolition in unoccupied properties can make it very uncomfortable to those still there. "The judges need to wake up, and surely they have," he said, making reference to another state high court that chose to look closely at eminent domain and change its mind. If they read the Poletown cases from Michigan, and then read the Hathcock opinion--the Michigan state Supreme Court overturned itself. We are not asking the impossible." Except it does seem impossible regarding Atlantic Yards, unless the longshot strategy proposed by DDDB lawyers can reopen the case.